My strange reading coincidences continue. Wayne Miller’s wonderful poetry collection The City, Our City (a review of which appears in our most recent print issue) was part of an uncanny string of books I was reading that had to do with the formation and destruction of cities. The very next two books I picked up after writing that review continued the trend. It was a bit spooky, to be honest. With a title like Songs and Stories of the Ghouls, it might at first blush appear as if the release date (at the beginning of November) of Alice Notley’s latest book might be part of a Halloween-themed publicity campaign. But considering that few poetry books get a publicity campaign of any sort, and in spite of ghouls and blood-sacs (more on that anon) and scattered bones and such, we are dealing with something as epic—literally—as Notley’s other monumental works. Derek Walcott, among others, noticed that Helen of Troy, the cause of the war inIliad and Aeneid, is only a shadow in the famous story. She doesn’t even have any direct dialogue—all of the words she supposedly said are spoken for her by men. Back in the late 80s, when she was working on her now-classic book-length poemThe Descent of Alette, Notley saw the epic up to the present as a form exclusively in the purview of the Masculine. She wanted to write a feminine epic. The result was dazzling. What we have in Songs and Stories of the Ghouls is essentially a continuation of that work. Here, she moves to women as they are portrayed in existing Classical texts—no less than Medea and Helen of Troy, one a murderess, the other portrayed as the cause of Troy’s fall. What’s at stake here is taking these stories back. Regarding the accepted story of Medea, Notley makes it clear: “the purpose of the story: to establish as reality, that a woman of power can only be evil.” “Nothing is unchangeable,” Notley says in the opening pages of the book’s second section, “except for a myth—let’s change that.” In a combination of prose and poetry, the women of these long-established tales are brought forth and are given a voice. They speak from their own mouths. Notley said in a brief conversation with me after her recent reading at Notre Dame that she was tired of politics, that Alettewas her overtly-political poem, that what she writes these days isn’t concerned so much with the political. But much of this new work is political in various ways. In the well-known story Medea has power, but always used it to help Jason. And why is the established story told in such a way—a woman of power who kills her brother and children and poisons another woman? To “establish as reality that a woman of power can only be evil.” “No one really believes in her power,” Notley writes, “She is only allowed it as an adjunct to her passion. She can’t just have it. No woman is as yet allowed that.” We move from gender politics to political demonstration: “When you protest, you’re no/ longer a civilian: they can kill you.” The ghouls here, reduced to sucking on blood sacs for sustenance, are the women suppressed in such a scheme. Even more intriguing is the kinship this volume has with, not only Classical epics, but also with H.D., whose Helen in Egypt I just by chance happened to pick up next. In both books we have a sense of a feminist retelling of the stories that concern women, but which have been only voiced by males. The two books could be considered sister texts; they resonate with each other in complex and astonishing ways; their aim is to reclaim the Feminine in these epics. 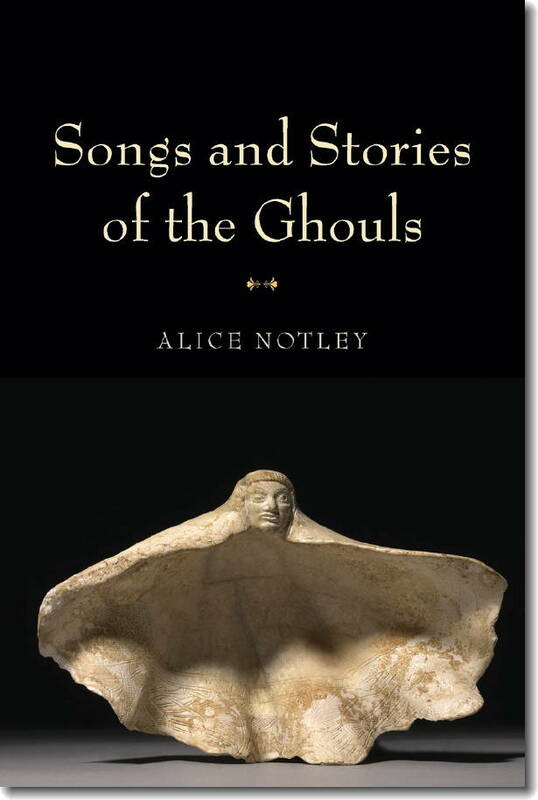 There is quite a bit more here to explore than can be included in a book review, but suffice it to say that Notley’s oeuvre is a rich field for exploration, and—along with Descent of Alette—The Songs and Stories of the Ghouls is a wonderful place to start. BINOCULAR VISION a finalist for the National Book Critics Circle fiction award!! !